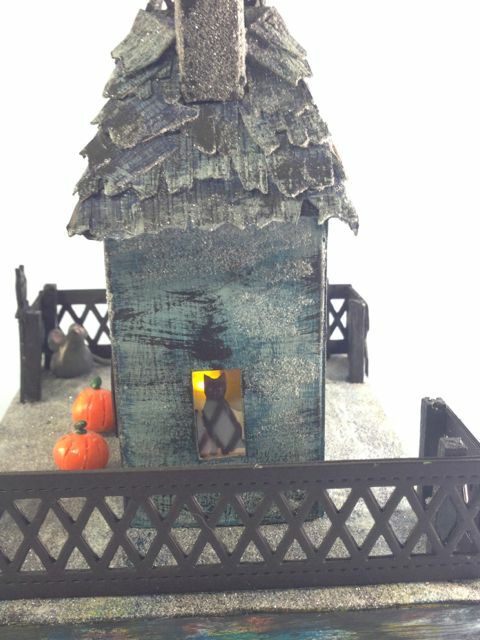 I made the Silhouette house a long time ago in June, but I never did get around to making a base for it. Well I just finished that tonight. The Silhouette House is named that for the cutouts in all 7 windows and the doorway even. When I put the fence up, I put 2 silhouettes of an owl on the fence as well. The window silhouettes show up very nicely when the inside is lit with LED candles. See what you think. I am very happy with this house. I also think the diamond lattice fence works well with the “railing” on the roof. This view shows the colors of the house better than the next 2 photos. Kitty in the window with fence reflected on the window. 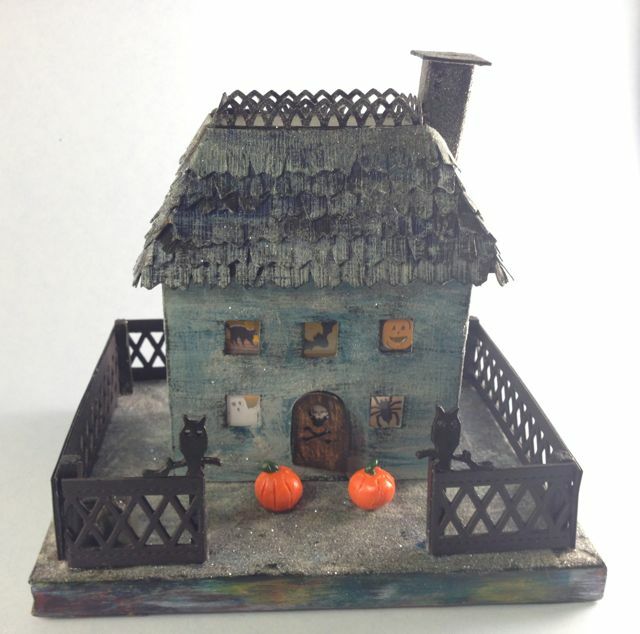 You can see the polymer clay mouse in the front corner by the fence. The cat is looking the wrong way. I love the lighting inside! The fence looks great with the lattice work on top. LOVE LOVE LOVE this, Lucy! This is so charming and yet artful at the same time. 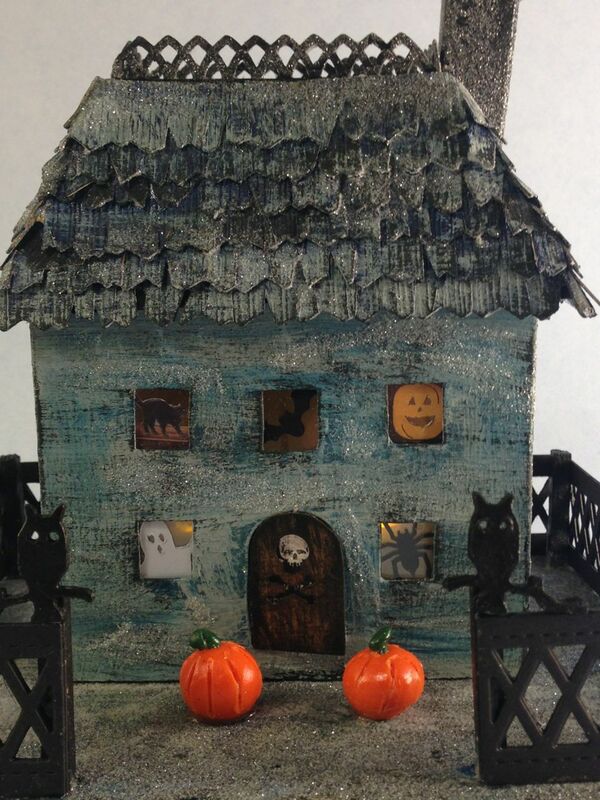 By refraining from adding an overload of textures or spooky embellishments you really made your little spooky house come alive and tell an intense and charming story. Great artwork! Thank you Lynn and Claudia. This is one of my favorite houses. I look at a lot of scrapbook, mixed media artwork and some of it is seriously loaded with embellishments. I'm just not good at placing embellishments anyway. I haven't put that much stuff on my houses because it would detract from the little cardboard house which should be the focus in my opinion. Thank you again for the comments. They are always appreciated.